TKO may not be the biggest name in martial arts, it is still a well known company that produces many great products. While Everlast, Century and Title are probably better known for heavy bags, TKO makes several quality punching bags that deserve consideration. In the reviews below we cover a TKO Muay Thai bag, a TKO punching bag and a TKO heavy bag wall mount. Definitely read the reviews to find out if one of these products are right for your training needs. The TKO Muay Thai Heavy Bag is an average sized Muay Thai bag that you might find in a Muay Thai or MMA gym. It is 72 inches tall and weighs 125 pounds, which is comparable to most other Muay Thai bags. The bag is constructed with slick PVC coated vinyl and the seams are made with reinforced nylon, which should keep the bag intact even after heavy beatings. The bag comes hydraulically stuffed with a blended fiber filler for even weight distribution. This is nice as it should give you a consistent resistance experience when striking any part of the bag. Some people think it’s a little softer than comparable Muay Thai bags. Also, the PVC coated vinyl surface makes it comfortable for using unprotected weapons like kicks, elbows or knees. However, like with any bag, we still strongly recommend you use hand protection (i.e. gloves) if you are going to be punching the bag. It’s easy to cut up your knuckles if you don’t wear gloves when striking. The TKO heavy bag can be secured to the ground by the loop at the bottom if a swinging bag is not preferred or practical in the training space because of its height. Because of its softness and smooth surface, we would recommend this bag to a wide variety of people. Aerobic fitness users would get a lot out of training with this bag, as would lighter beginner Muay Thai and MMA fighters. For serious fighters looking to improve their shin conditioning and kicking power, we might recommend a Muay Thai bag that is a little harder and offers a little more resistance. All in all, a fairly decent product. 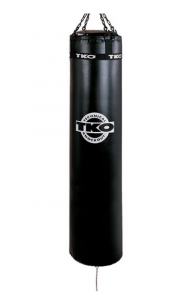 The TKO All Purpose Canvas Heavy Bag is significantly lighter than most punching bags that you might find in a boxing or MMA gym (unless they are training children). The bag is constructed from polycanvas and it has seams that are made reinforced nylon to keep it from bursting. The bag’s light weight means that it can be hung easier, which is especially useful for a home environment. This bag comes pre-stuffed with a blended fiber filler. It has fairly high shock absorbency, which combined with its weight makes it a very forgiving heavy bag. That makes it excellent for avoiding injury. Polycanvas is not as smooth as other materials, so it’s possible that you may scrape yourself if you don’t wear proper training protection. Therefore we always suggest you use gloves when hitting a training bag, as you risk losing a great deal of skin off your knuckle (or knees or elbows) should you try to strike the bag with powerful bare-knuckle punches. Due to the weight of the bag, this TKO heavy bag will definitely swing freely with even medium strength kicks or punches. Therefore we’d suggest securing it to the ground, which can be done by a loop on the bottom of the bag. Since the bag is lighter than most other MMA punching bags, it is really meant for amateur training or for lighter fighters. The general rule of thumb is to use a punching bag that is about 1/2 your body weight. So keep this in mind if you are interested in this bag. Larger adults or fighters will not get the resistance that they need from it. The bag may also be suitable for children who are just getting started in martial arts training. 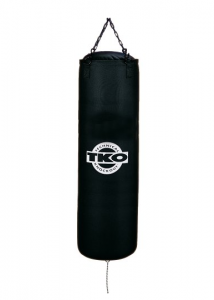 Overall, we think this is a very good 50 pound TKO punching bag that you should consider. This wall mount is definitely worth considering if you want to buy (or already have) a TKO punching bag (or actually any brand). What’s nice about using a wall mount is that it can be easier to set up than a heavy bag stand. The wall mount is also good to use if you don’t want to (or can’t) hang a bag directly from the ceiling, or a stand is too big for the room you in which you want to use the bag. The wall mount is very sturdy and can hold bags up to 100 pounds. One of the very cool features of the mount is the pull pin swivel system, which lets you move the bag to the side when not in use. This is very convenient for home use, especially in shared space (ex. a garage). The handle on the mount extends 27 inches from the wall, so there is sufficient room for striking. Of course, just like a heavy bag stand, a wall mount restricts 360 degree access to the bag. So you can’t practice circling and other techniques. However, other than that, the wall mount may be a good choice to hang your training bag. Training with a wall mount is a good way to practice your striking techniques with kicks and punches. Just take care to to pay attention to where the wall is as you don’t want to miss the bag and hit the wall instead. 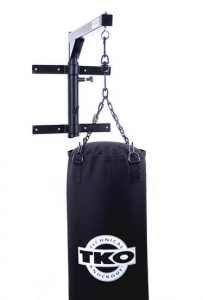 If you don’t want to hang your punching bag from the ceiling, but aren’t sure about a wall mount, you can also check out our heavy bag stand reviews to see if a stand would be a better option to use for your MMA training.